It has been more than fifty-years since the 1967 Boston Red Sox captivated New England and built the foundation of Red Sox Nation but Jim Lonborg’s clutch pitching down the stretch lives on in the memories of Red Sox fans. 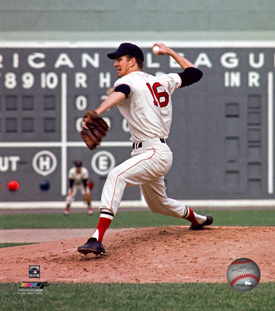 Former Red Sox pitcher Jim Lonborg pitched one of the most important games in the history of Fenway Park on the last day of the 1967 season. A win over the Minnesota Twins guaranteed the team at least a tie for the American League Pennant but a loss would bring their storybook season to a close. The particular challenge of pitching at Fenway Park played a big role in “Gentleman Jim’s” pre-game routine. Worked out pretty well is a very large understatement. Lonborg held the Twins to three runs over nine innings and executed a perfect bunt to jump-start a five- run Red Sox sixth inning, His 22nd win placed him atop the league in that category and gave the Red Sox their first American League Pennant in 21 years. 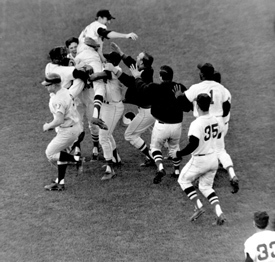 Overjoyed Red Sox fans celebrated the 5-3 victory by carrying Jim Lonborg around the field on their shoulders. When Jim Lonborg enrolled at Stanford University in 1960 as a pre-med major, a career in professional baseball wasn’t even on his radar screen. But a stellar season in the Basin League—the west’s counterpart of the Cape Cod League—attracted the interest of baseball scouts. Lonborg signed with the Red Sox for a modest bonus and reported to the Red Sox single-A franchise in Winston-Salem for the 1964 season. Lonborg was so impressive at Winston-Salem that the Red Sox moved him all the way to their top farm club in Seattle at mid-season. He pitched well against more experienced players in Triple-A, and after an outstanding spring training in 1965, he was promoted to the big league club. After just one season in professional baseball, he was about to get his first look at Fenway Park. Jim Lonborg’s first trip to Fenway Park is indelibly etched in his memory. “After spring training we came to Boston to get ready for Opening Day. We stayed at the old Kenmore Hotel and since I had never been to Boston, I had to ask the doorman for directions to Fenway Park. “As I approached the park it didn’t look anything like any ballpark I had ever seen before,” he recalls. “I was from California and I had been to Dodger Stadium and Candlestick Park, which were newer parks, so Fenway looked very different to me. During his seven seasons pitching for the Red Sox, exactly one-half of Jim Lonborg’s 68 pitching victories came in Fenway Park and one-half came on the road. Despite this even split, he acknowledges that pitching in front of the hometown fans has its advantages. 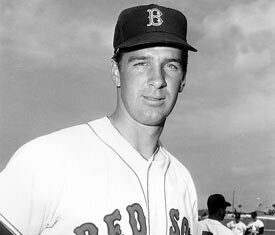 For Jim Lonborg’s first two seasons with the Red Sox in 1965 and 1966, the team drew an average of fewer than 10,000 fans per game. Asked if that was disheartening for players, he says, “Not really, because we knew that the fans that turned out were avid fans. In 1967, the home opener against Chicago was postponed due to inclement weather and only 8,324 fans showed up the next day to watch Jim Lonborg defeat the White Sox 5-4. As the season progressed and the Red Sox emerged as pennant contenders, the team captured the imagination of New England and attendance surged. The 1967 Boston Red Sox drew 1,727,823 fans to Fenway Park, the most in the team’s history at that time. 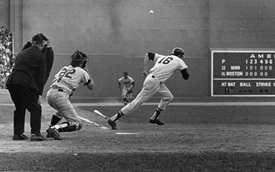 Fenway’s field, specifically the infield grass, became a focus of the pitching staff that season. “A number of us on the pitching staff had a lot of sink on our pitches, and we induced a lot of ground balls. The infield grass seemed short to us and we went to the grounds crew and asked them to let the grass grow a little higher. They [the grounds crew] did, and it helped slow down grounders and give our infielders a better shot at the ball. Hold them he did, but the Twins were hanging tough, and when Lonborg led off the home half of the sixth inning, the Red Sox still trailed 2-0. Ever the thinking-man, he noticed that third baseman Cesar Tovar was playing back. Lonborg dropped down a surprise bunt and legged out a base hit that keyed a five-run Red Sox uprising. The Twins countered with a run in the eighth, to make it 5-3, but there was no way that Lonborg was going to relinquish the lead. With two down in the ninth, and close to 35,000 Fenway Faithful on their feet in anticipation, he jammed Rich Rollins with a fastball, and Rico waited anxiously for the harmless popup to settle in his glove. “When I look at that picture of the last out, I think about how fortunate I was. That could never happen today. First of all, there would be a relief pitcher standing on the mound. And with the playoff format coming into play in 1969, it has been almost 50 years since you could win the pennant outright on the last day of the season. And finally, you couldn’t let 10,000 people out on the field to celebrate the way they did that day. That crowd was purely spontaneous, filled with good will, and delirious with joy. I will never forget that moment. He clearly remembers that Fenway was filled with celebrities and dignitaries, but it was a conversation with Dodgers’ pitcher, and future Hall-of-Fame member, Sandy Koufax that stands out for him. “I was talking with Sandy, who was with the NBC-TV crew, before my start in Game Two,” he recalls. After following Koufax’ advice, Jim Lonborg retired the first 18 Cardinal hitters he faced. Hopes for a perfect game were dashed when he walked Curt Flood with one out in the seventh inning, but he retired the next two batters easily and he entered the Cardinals’ eighth inning six outs away from pitching only the second no-hitter in World Series history. When Cardinals’ second baseman Julian Javier broke the spell with a cleanly hit double with two outs in the eighth inning, the sellout crowd at Fenway rose as one to give Lonborg an extended ovation. Jim retired the final four St. Louis batters with ease and finished with a one-hit, 5-0 victory. It was clearly one of the most dominant Red Sox pitching performance in World Series history. He agrees that the expanded Red Sox clubhouse is a big enhancement for today’s players. But he believes that the former cramped clubhouse of his day offered one advantage. “Our lockers were so close together that it was easy to carry on a conversation that included most of your teammates. We would sit around after the game and talk about what happened and talk about the next game. The close quarters really encouraged that,” he emphasizes. 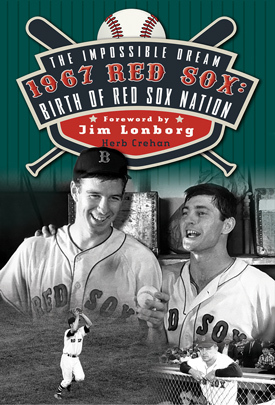 On the last day of the 1967 regular season, Jim Lonborg achieved one of the great victories in the history of Fenway Park, helping to clinch the last American League Pennant won by the Boston Red Sox during the regular season. And Lonborg was the last Red Sox player we will ever see paraded around Fenway Park surrounded by 5,000 adoring fans. 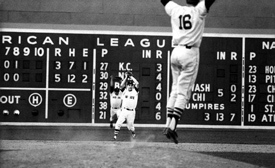 Jim Lonborg is an integral part of the wonderful memories that Red Sox fans hold of Fenway Park. He helped to build the foundation that Red Sox Nation rests upon today! Portions of this article originally appeared in The Impossible Dream 1967 Red Sox: Birth of Red Sox Nation. What great memories! Thanks for sharing!